Ben & Jerry’s has launched a new campaign titled “Ben & Jerry’s Cereal Splashback”, taking fans on a nostalgic “feel trip” back to milk-splashed breakfast cereal meals. 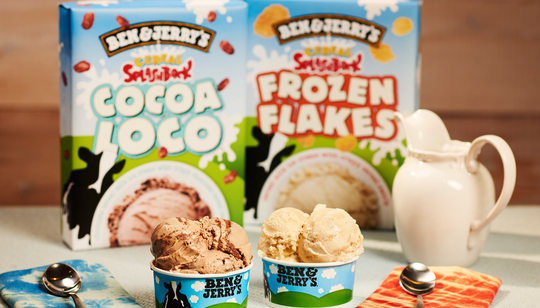 The campaign was launched with two new cereal milk ice cream flavours – Cocoa Loco and Frozen Flakes. As part of the campaign, the company is hosting first-ever the Ben & Jerry’s #CerealouslyGood Ice Cream Feast, offering unlimited scoops of cereal milk ice cream and unlimited toppings. The campaign will also be executed on social media and radio, and will run until the end of October, with the flavours permanently added to all Ben & Jerry’s Scoop Shops. Golin Singapore, Mindshare, Tiger Pistol and Concept Alliance are responsible for executing the campaign. Ben & Jerry’s targets Millennials who value experiences, stand by what they believe and have a sense of spontaneity. Millennials take the concept of “You are what you eat” to a new level when it comes to food, by seeing it as another platform to explore and express their sense of identity. They are also “adventurous and bold, unafraid to try new and unique flavours”. “Ben & Jerry’s has always been about having fun and making it all better for our fans. And our fans are some of the most adventurous and bold when it comes to seeking out new flavours or unique experiences. With the #CerealouslyGood Ice Cream Feast, we hope to engage by providing a personalized experience and fun way of discovering the new flavours, and at the same time, give them something fresh and interesting to share with their friends and families,” Ellen Yap, marketing manager (Foods & Refreshment), Unilever Singapore, said. “By creating a surprising brand experience, we hope to generate positive brand connection that are memorable and talked about. By making our fans feel like they are part of something special, we can turn a one-off campaign, into a long-term relationship,” Yap added. Managing director of Twitter East Asia James Kondo proves that the future of social media lies in a partnership with – you can nev..
IN.FOM’s appointment will not affect Microsoft’s existing communications agency relationships in individual markets across the reg..